The origin of the Order cannot be shown with historical accuracy. The statements of the Bavarian chroniclers, that the Order was brought over to Germany from the Holy Land, as early as the twelfth century by Welf I., Otto III. and IV. and Eckart JL, are, at least, not sufficiently warranted by historical records. The same may be said of the alleged renewal of the Order by the Emperor Maximihan I., who is said to have founded an Order of St. George in 1494, previous to the campaign against the Turks. These questionable traditions are, however, closely connected with the strictly historical account of the second renewal, or rather first foundation of the Order by the Elector Charles Albert, afterwards the Emperor Charles VII., who received it as a pious legacy from his father Max Emanuel. The latter had, during his campaigns against the Turks, solemnly resolved to renew it as a military badge of distinction ; but this he was prevented by death from accomplishing. His intention was, however, carried out by his son, who founded on the 24th April, 1729, the knightly Order of St. George, imposing upon the members the duty of venerating that saint, and believing in the Immaculate Conception of the Virgin. He gave statutes to the Institution, and richly endowed it with large priories, prebends, and afterwards with proves tships ; and Pope Benedict XIII. confirmed the Order, by a Bull, granting to it all the honours, privileges, and advantages which had been conceded by previous Popes to all the high Orders of Germany. After the extinction of the Louis line of Bavaria, the Elector Charles Theodore adopted it (1778) as a Palatinate-Bavarian institution, while his successor Maximilian Joseph sanctioned it as a royal Bavarian Order, only second in rank to that of St. Hubert. King Louis made some alterations in the constitution in 1827. The King is the Grand Master while the Crown Prince is first Grand Prior, and the next Prince second Grand Prior. 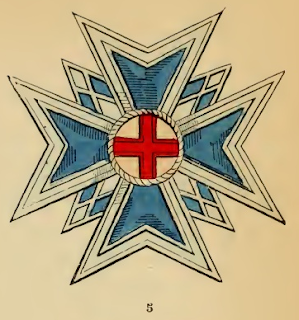 The Chapter comprises six Knights of the Grand Cross, twelve Commanders, and an unlimited number of Knights, some ofwhom are nominated by the Grand Master as Honorary Knights of the Grand Cross. Since 1741, a spiritual class has been added, consisting of a Bishop, a Provost, four Deans, and a number of Chaplains, who enjoy the distinction of Papal House Prelates. This class has been instituted and confirmed by the Bulls of Popes Benedict XIV. (6th October, 1741), and Pius VL (30th April, 1782). The candidates must prove their Catholic descent, and the Order consists of two languages : the German and a foreign; the latter, however, counts only about one third of the members. The possession of another Order excludes the reception of this, without the special permission of the Grand Master. In the oath, the candidates confess to believe in the Immaculate Conception of the Virgin without the original, or birth-sin. The Order celebrates, therefore, besides its anniversary, the 24th April, the 8 th December, as the festival of the Holy Conception of the Virgin. The costume on these occasions consists of a long robe of bright blue velvet, with a train and without sleeves, more or less embroidered with silver, lined with white satin or Gros-de-Naples, and with a velvet collar of the same colour. Upon this robe is the star of the Order embroidered on the left side (No. 5). Beneath is worn an undergarment opening by buttons to the half of the bosom. Short breeches of white satin, and similar rosettes, trimmed with silver fringes, white silk stockings, and white cordwain shoes, a high round hat of black felt with a silver sling of six, three or four cords, white leather gloves, a ruff of white lace buttoned in the front and hanging down upon the breast by the two ends, and finally a white satin sash round the body and fastened in a ring on the left side, with a short Knight's sword in a white belt, complete this elegant costume. The badge (Nos. 6 and 7) is worn by a broad sky-blue ribbon with white and dark blue borders, by the Knights of the Grand Cross upon the breast, and by the Commanders and Knights round the neck. The size differs with the degree of rank. The decoration represents on the adverse (No. 7) the Immaculate Conception of the Virgin, and on the reverse St. George on horseback together with the dragon. In the four corners of the Cross, on the obverse, are seen the initials of the words : "Virgini immaculatae Bavaria immaculat" (Immaculate Bavaria to the immaculate Virgin) ; on the reverse is the motto of the Order : "Justus ut Palma florebit" (The just will flourish like a palm tree). Upon the chain of which there are three links in No. 11 are distributed the words : "In Fide, Justitia et Fortitudine" (In faith, justice and valour).